The World Wide Study Bible includes commentary exposition & sermons. "Receiving the Sender," "Blessed the Womb," "Leader as Servant," The Jesus Database, an online annotated inventory of the traditions concerning the life and teachings of Jesus. Dr. Gregory C. Jenks, FaithFutures Foundation. XLIV.11-30, 44, 49; XLV.1-7, 9-11, 19-21; Tatian's Diatessaron (c. 150-160). VI.25, VII.25, Ecclesiastical History, Eusebius of Caesarea, (c 320). "For inasmuch as the Greek word paschein means to stiffer, therefore pascha has been supposed to mean suffering, as if the noun derived its name from His passion: but in its own language, that is, in Hebrew, pascha means passover..."
"Deny me not having a part with Thee, and I deny Thee not any part of my body to be washed." "Wash our feet, that were formerly cleansed, but have again been defiled in our walking through the earth to open unto Thee." "...in washing the feet of disciples who were already washed and clean, the Lord instituted a sign, to the end that, on account of the human feelings that occupy us on earth, however far we may have advanced in our apprehension of righteousness, we might know that we are not exempt from sin..."
"Let every one, therefore, so receive Him that is sent, that in His person lie may give heed to Him who sent Him." "...in the completed separation of that arch sinner from their company, and in the remaining around Him of His saints, we have the foreshadowing of His glorification, when the wicked shall be finally separated, and He shall dwell with His saints through eternity." "...after He rose again He was with them, as has been said, for forty days in the full manifestation of His bodily presence; but He was no longer with them in the fellowship of human infirmity." "How wonderful is the character of that death, which was all but swallowed up in penal sufferings, had it not been over and above absorbed in delights!" Commentary, John 13:31-35, Elisabeth Johnson, Preaching This Week, WorkingPreacher.org, 2016. "he context of this passage, of course, is John's account of Jesus' last supper with his disciples." The Truett Pulpit, Dr. Paul Simpson Duke, Co-Pastor, First Baptist Church, Ann Arbor, Michigan, 2016. "It is easy to come up with examples of what loving one another does not look like. Can you think of concrete examples of what it looks like for followers of Jesus to love one another? How might that preach?" "This passage is one of the most well-known in scripture, but often it is also one of the least followed." "Tough Love," Alan Brehm, The Waking Dreamer, 2016. "The kind of love that Jesus said would be the defining mark of those who claimed to follow him is the willingness to humble ourselves to do for one another what we would not normally do. It is the ultimate "tough love."" Commentary, John 13:31-35, Karyn Wiseman, Preaching This Week, WorkingPreacher.org, 2013. "One of the stunning parts of this text is the location. This passage comes on the heels of Judas leaving the other disciples at the last supper to betray Jesus." "Bebb's Speech at Revonoc," sermon discussion from Frederick Buechner, Frederick Buechner Blog. "'Dear hearts,' Bebb said, 'we got to love one another and Jesus or die guessing.'" "This is a very brief pericope, selected for the lection – one would think – because of 'new commandment' to love. However, the context is very important." " ...invite your hearers to recall a time this past week when they chose love." "The message of today’s readings is Love. But whose love? And for whom? What kind of Beloved Community do we imagine? To what kind of Love is Christ calling us? And how, therefore, ought we to respond?" "This short text from John's gospel is like a glowing candle in the darkness, a command to love one another amid the realities of violence and betrayal as a continuation of Jesus' ministry in the world." "Evildoers," Nancy Rockwell, A Bite in the Apple, 2013. "Even Judas is part of the washed, part of the story of Easter." "Love One Another, For God's Sake!" Clint Schnekloth, The Hardest Question, 2013. "When and where have you experienced the love of God's people as testimony to our shared faith in Jesus?" Holy Textures, Understanding the Bible in its own time and in ours, John 13:31-35, David Ewart, 2013. "There are at least two challenges in Jesus' commandment, 'Love one another as I have loved you.' One is to deeply and correctly discern how Jesus loves. And the other is to let the 'you' be 'me.'" Comentario del San Juan 13:31-35, Miriam Lizeth Bermúdez, Working Preacher, 2013. Commentary, John 13:1-17, 31b-35, O. Wesley Allen, Jr,, Preaching This Week, WorkingPreacher.org, 2012. "...like so many of John's passages, this chapter is filled with a myriad of different theological and narrative nuances." Comentario del Evangelio, San Juan 13:1-17, 31b-35, Edwin Gonzalez-Castillo, Preaching This Week, WorkingPreacher.org, 2012. Commentary, John 31:31-35, Frank L. Crouch, Preaching This Week, WorkingPreacher.org, 2010. "When we live in his love, we can, if called upon, fulfill the highest form of love." John 13:31-35, Easter 5C, Comments (commentary) and Clippings (technical notes for in-depth study), Chris Haslam, Anglican Diocese of Montreal. "Clean Feet: A Maundy Thursday Meditation," Alyce M. McKenzie, Patheos, 2011. Exegetical Notesby Brian Stoffregen at CrossMarks Christian Resources. "First Thoughts on Year C Gospel Passages in the Lectionary: Easter 5," William Loader, Murdoch University, Uniting Church in Australia. "Oneness in love is the language of intimacy. It applies to our relation with God and Christ (and to their relationship). It is to apply also to our relationships with each other in community." John 13:1-17, 31b-35, Maundy Thursday, Comments (commentary) and Clippings (technical notes for in-depth study), Chris Haslam, Anglican Diocese of Montreal. "We ought to be honest about this today; it is hard sometimes to follow Christ. It gets hard as we endure the vagaries and vicissitudes of life." Commentary, John 13:1-19, Luke A. Powery, The African American Lectionary, 2009. "Even when we betray Jesus by not following him the way we should, he still stands waiting for us with a basin of water and a towel, ready to serve us with love." 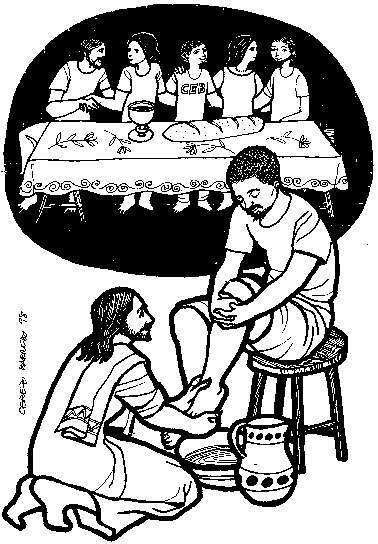 "Holy Thursday - The Footwashing," Gospel Analysis, Sermons from Seattle, Pastor Edward F. Markquart, Grace Lutheran Church, Seattle, Washington. Detailed background and exegesis. "The Real Meaning of Mentorship," study guide, Robert B. Kruschwitz, (other resources at) "Friendship," Christian Reflection, The Center for Christian Ethics at Baylor University, 2008. The Revelation of God's Glory, Easter to Trinity with the Gospel of John: Bearing Witness to the Father, Son, and Holy Spirit, Paul S. Berge, Word & World Texts in Context, Luther Northwestern Theological Seminary, 1995. "In the midst of his betrayal by Judas and denial by Peter, Jesus calls the community to live in love with one another, a pattern expressed in his own life and death." "When someone joins our congregations, what does that mean? It should mean, in part, that they become objects of this special "familial" love we have toward our own; and they become givers of this special love towards other members." "This is bedrock evangelism - Love One Another." "The Believer and Daily Cleansing (John 13:1-17)," by J.Hampton Keathley III at the Biblical Studies Foundation. "Unwashed feet is the equivalent of a believer trying to walk with the Lord, study the Word, pray, or serve Him with known sin in the life, like the sin of pride and selfish independence. The dialog with Peter and his reluctance to allow the Lord to wash his feet illustrates our slowness to grasp this truth." "God Loves Beyond Betrayal (John 13:1-11)," John C. Purdy. Chapter 9 of God With a Human Face (1993), republished at Religion Online. "The love that Jesus showed in washing the disciples? feet is like the love God showed for us in our creation - an act of renunciation and restraint. This is scandalous, of course. The soul does not want to be face to face with a God who is less than all-powerful. The spectacle of a kneeling God is devastating. No! Let God be seated on a throne, holding all the symbols of power; let us be the ones to kneel. No wonder Peter is horrified when he sees Emmanuel crouching at his feet." "The Footwashing in John 13:6-11: Transformation Ritual or Ceremony?" Jerome H. Neyrey, in The Social World of the First Christians: Essays in Honor of Wayne A. Meeks, 198-213. L. M. White and O. L. Yarbrough. Minneapolis: Fortress Press, 1995. "Peter's footwashing ritual has to do with his transformation into the role of an elite, public witness to Jesus with accompanying risk of death - a one-time event. Conversely, the ceremony which the disciples will perform to members of their circle confirms their role and status as leaders of the group - an action to be repeated regularly. Two different rites are described in 13:6-11 and 12-20, and the use of materials from anthropology offers a fruitful way of clarifying the social dynamics of the narrative." "While our culture reduces 'hospitality' to friendliness and private entertaining, Christian hospitality remains a public and economic reality by which God re-creates us through the places and people we are given." Berge, Paul S., "Easter to Trinity with the Gospel of John: Bearing Witness to Father, Son and Holy Spirit," Word & World, 1998. Coloe, Mary L., "Welcome into the Household of God: The Foot Washing in John 13," The Catholic Biblical Quarterly, 2004. Culpepper, R. Alan, "The Johannine Hypodeigma: A Reading of John 13," Semeia, 1991. Duke, Paul D., "John 13:1-17, 31b-35, Between Text and Sermon," Interpretation, 1995. Guenther, Margaret, "No Exceptions Permitted," The Christian Century, 1995. Friedell, Val, "A Community of Friends, John 13:1-17," Brethren Life and Thought, 2008. Hays, Richard B., "An Emergency Directive," The Christian Century, 1992. Herhold, Robert M., "Foot Washing and Last Things," The Christian Century, 1983. Moloney, Francis J., S.D.B., "A Sacramental Reading of John 13:1-38," The Catholic Biblical Quarterly, 1991. Neyrey, Jerome H., "Despising the Shame of the Cross: Honor and Shame in the Johannine Passion Narrative," Semeia, 1994. Olson, Duane A., "The Church in Mission: Gospel Texts for the Sundays after Easter (Series C)," Word & World, 1995. Pidgeon, George Campbell, "Root and Fruit of Christian Love: Reflections on John 13:34-35; 15:1-14," Theology Today, 1952. Somerville, James G., "By Our Love," The Christian Century, 1998. Zorrilla, Hugo, "A Service of Sacrificial Love: Footwashing (John 13:1-11)," Direction, 1995. "Redeeming Our Religion," Dr. R. Kirby Dogsey, Day 1, 2012. "The Stand-In Church," John 13:1-17, The Rev. Lillian Daniel, Day 1, 2011. "Personal Touches that Matter," 05.04.2007, David Zersen, Göttinger Predigten im Internet: Every Sunday Sermons based on the RCL by a team of Lutheran theologians/ pastors. "An Encounter that Never Happened," Philip McAlister, Preacher's Magazine, 2006. "An Incomplete Picture," 13 April 2006, Luke Bouman, Göttinger Predigten im Internet: Every Sunday Sermons based on the RCL by a team of Lutheran theologians/ pastors. "Loving as Jesus Loved," the Rev. Dr. John Claypool, Day 1, 2004. "It's Hard to Say Goodbye," "Love Can Be So Simple," "I Love You Charlie Brown," "A Picture Is Worth a Thousand Words," Pastor Edward F. Markquart, Grace Lutheran Church, Seattle, Washington. "That You Should Do As I Have," - Maundy Thursday - 24 March 2005, Samuel Zumwalt, Göttinger Predigten im Internet: Every Sunday Sermons based on the RCL by a team of Lutheran theologians/ pastors. "Sermon for the 5th Sunday in Easter," the Rev. David Miller, Day 1, 2001. "What a Christian Community Can Offer a Polarized Society," the Very Rev. Nathan Baxter, Day 1, 1996. "Beyond Introspection," the Rev. Dr. Hugh L. Eichelberger, Day 1, 1996. "In the Heat of the Night," "Betrayal," "What a Friend We Have in Jesus," "An Education In Love," L. Gregory Bloomquist, Saint Paul University, Ottawa. "The Greatest Commandment - Love," "The Last Supper," Illustrating the Story (lessons, children's sermons), coloring pages, activity sheets, crafts, children's songs. MSSS Crafts. "Building a Model Life," and "He Loves Us All," Charles Kirkpatrick, Sermons4kids.com. "The Master Becomes a Servant," children's study, puzzles, coloring sheet, etc. Higher Praise Christian Center. John 13:15, memory verse activity, MSSS Crafts and Resources for Bible Stories. "Jesus Washes the Disciples' Feet," Reader's Theater, Lisa Ann Moss Degrenia, 2012. Clip Art, John 13:35, Fr. Richard Lonsdale, Resources for Catholic Educators. 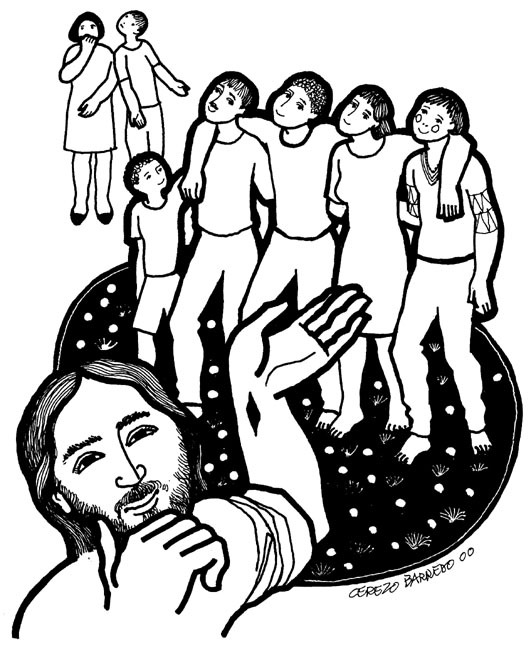 Holy Thursday, Lectionary Clipart, Hermanoleon Clipart. John 13:1-15, John 13:31-35 at Cerezo Barredo's weekly gospel illustration. Liberation emphasis. Holy Week Wednesday, Maundy Thursday, Pitts Theology Library Digital Image Archive. Washing Feet, Henry Martin, sermons4kids.com. Hymns with Scripture Allusions: John 13:5, 7, 13, 34. The Cyber Hymnal. Hymn selections, John 13:21-32, (United Methodist) and more from Hymnsite.com. Hymn selections, John 13:1-17, 31b-35, (United Methodist) and more from Hymnsite.com.